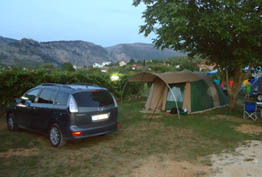 Welcome to the WebSite of Autocamp "Blagaj". Autocamp "Blagaj" is situated 12 km southeast of Mostar, in the old Herzegovina town, Blagaj. The camp spreads over the area of nearly 2500 m2, which means 25-30 camping places in beautiful natural environment along the Buna River. The camp is the ideal setting for your vacations on the river whose cold water will help you stay refreshed during hot summer months. The Buna spring is one of the most powerful springs in Europe (average 36m3/s). This is a perfect place for vacation and holidays. AutoCamp is open over the year. THE PRICE OUT OF SEASON 10-20€. Autocamp "Blagaj" is 40 km away from Shrine of the Queen of Peace – Medjugorje, 20 km from Pocitelj - Old Town and 30 km from National Park Hutovo blato. In Blagaj, there are grocery shops, post office, infirmary , school with football and basketball playground. Autocamp "BLAGAJ" is situated 12 km southeast of the most beautiful town in Herzegovina Mostar, in the old Herzegovina town, Blagaj. Autocamp "Blagaj" is situated along the river Buna. Buna is known for its clear water. It ideally fits into the natural ambient. During your stay at our Camp you can visit numerous hystorical monuments of the Blagaj.